THE NUMBER 7, GODS COMPLETION AND DIVINE NUMBER. This great bible study by Michael Hoggard on the number seven will show you the value that God places on the number seven. And on the time line in “The Mystery of the Ages” and in the chapter The Incredible Sevens you will see how the time chart adds up to God’s word. 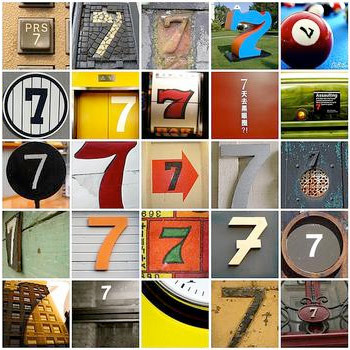 The number 7 is God’s very own number, and is associated with Divine completion and perfection. It becomes apparent to most who read the Scriptures that the number 7 is the most significant number in all of the Scriptures. Therefore, it stands to reason there must be some extremely important patterns that are associated with the number 7. As you read through this article you will understand that the use of the number 7 in the KJV is what sets it apart from the other translations. The entire Bible is based upon the things that God Almighty has said to His servants, the prophets. They wrote these things down exactly as they had received them. That is why the Bible is such a perfect book. It comes from a perfect God. A common phrase that is found in the Old Testament, “Thus saith the Lord of Hosts”, is a phrase that reveals to us that God has indeed given us the very words that have come directly from His mouth. This phrase is found exactly 70 (7 x 10) times in the King James Bible. The phrase, “his servants the prophets”, is found 7 times in the Bible (see 2 Kings 17:23; 21:10; 24:2; Jeremiah. 25:4; Dan. 9:10; Amos 3:7; and Rev. 10:7). Notice that in Amos and Revelation the Lord chose to place it in the 7th verse so that we would know that it has a special meaning. In each case we find that the prophets are the recipients of the Word of God. The Bible is a book of prophecy. The word “prophecy” is found 21 (7 x 3) times in the Scriptures. The 21st occurrence of this word reveals that we should be very cautious about how we handle the Word of God: “And if any man shall take away from the words of the book of this prophecy, God shall take away his part out of the book of life, and out of the holy city, and from the things which are written in this book” (Revelation 22:19). The very first version of the written Word of God was the Ten Commandments. God has placed a very important value on the Ten Commandments, for we find them located in the 70th chapter of the Bible, Exodus 20. The Bible mentions that they were written on “tables of stone”. In fact, the Bible mentions 14 (7 x 2) times that they are written on “tables of stone”. Also, in the 70th chapter of the New Testament (John 2), you will find the very first miracle that Jesus performed. Buy The Mystery of the Ages in Ebook or Hardcopy here. Read this series of posts of just how significant the number seven is in the bible. This is an 8 part series. Copyright(c)2014-2018 Roger King All rights reserved.